NASA's twin GRAIL spacecraft to study the moon from crust to core are nearing theirNew Year's Eve and New Year's Day main-engine burns to place the duo in lunar orbit. The spacecraft are scheduled to beplaced in orbit beginning at 1:21 p.m. PST (4:21 p.m. EST) for GRAIL-A on Dec. 31, and 2:05 p.m.PST (5:05 p.m. EST) for GRAIL-B the next day. "Our team may not get to partake in a traditional New Year's celebration, but I expect seeing our twospacecraft safely in lunar orbit should give us all the excitement and feeling of euphoria anyone in this line of work would ever need," said David Lehman, project manager for GRAIL from NASA'sJet Propulsion Laboratory. The distance from Earth to the moon is approximately 250,000 miles (402,336 kilometers). NASA'sApollo crews took about three days to travel to the moon. Launched from Cape Canaveral Air ForceStation Sept. 10, 2011, the GRAIL spacecraft are taking about 30 times that long and covering morethan 2.5 million miles (4 million kilometers) to get there. This low-energy, long-duration trajectory has given mission planners and controllers more time toassess the spacecraft's health. The path also allowed a vital component of the spacecraft's singlescience instrument, the Ultra Stable Oscillator, to be continuously powered for several months. Thatallowed it to reach a stable operating temperature long before science measurements from lunar orbitare to begin. "This mission will rewrite the textbooks on the evolution of the moon," said Maria Zuber, GRAILprincipal investigator from the Massachusetts Institute of Technology in Cambridge, Mass. "Our twospacecraft are operating so well during their journey that we have performed a full test of our scienceinstrument and confirmed the performance required to meet our science objectives". As of Dec. 28, GRAIL-A is 65,860 miles (106,000 kilometers) from the moon and closing at a speedof 745 miles per hour (1,200 kilometers per hour). GRAIL-B is 79,540 miles (128,000 kilometers)from the moon and closing at a speed of 763 mph (1,228 kilometers per hour). During their final approaches to the moon, both orbiters move toward it from the south, flying nearlydirectly over the lunar south pole. The lunar orbit insertion burn for GRAIL-A will take approximately 40 minutes and change the spacecraft's velocity by about 427 mph (688 kilometers perhour). GRAIL-B's insertion burn 25 hours later will last about 39 minutes and is expected to changethe probe's velocity by 430 mph (691 kilometers per hour). The insertion maneuvers will place each orbiter into a near-polar, elliptical orbit with a period of 11.5hours. Over the following weeks, the GRAIL team will execute a series of burns with each spacecraftto reduce their orbital period from 11.5 hours down to just under two hours. At the start of the sciencephase in March 2012, the two GRAILs will be in a near-polar, near-circular orbit with an altitude ofabout 34 miles (55 kilometers). When science collection begins, the spacecraft will transmit radio signals precisely defining thedistance between them as they orbit the moon. As they fly over areas of greater and lesser gravity,caused both by visible features such as mountains and craters and by masses hidden beneath the lunarsurface. they will move slightly toward and away from each other. An instrument aboard eachspacecraft will measure the changes in their relative velocity very precisely, and scientists willtranslate this information into a high-resolution map of the moon's gravitational field. The data willallow mission scientists to understand what goes on below the surface. This information will increase our knowledge of how Earth and its rocky neighbors in the inner solar system developed into the diverse worlds we see today. 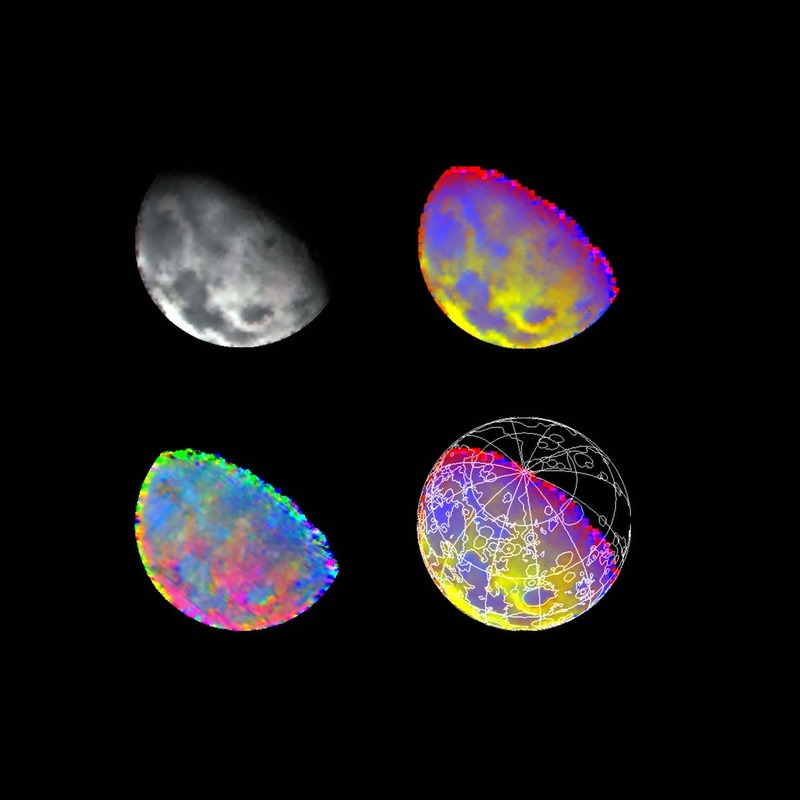 Four images of the Moon at the top of page were taken by Galileo's Near-Infrared Mapping Spectrometer (NIMS).